What distinguishes Kellogg is a curriculum that offers multiple strengths. While some B-schools report that 80 percent of their graduates are recruited by just a handful of companies, at Kellogg the situation is markedly different: more than 150 companies recruit Kellogg talent, indicating what Dean Jain calls "balanced excellence" throughout the school. Lawrence "Gene" Lavengood, professor of business history and ethics, was a beloved Kellogg teacher whose influence has been felt throughout the school and by many of its graduates. Lavengood arrived at Northwestern in 1953 and retired in 1994, although he remained active in Evanston and on campus afterward. In 1994, Kellogg renamed its Professor of the Year Award in honor of Lavengood. He died in July 2006. Harry Kraemer '79 agrees. A partner at Chicago-based private equity firm Madison Dearborn, Kraemer is also clinical professor of management and strategy at Kellogg and the former CEO of Baxter International Inc., a $9 billion global healthcare company employing more than 50,000 people. Kellogg, he says, provided the foundation that enabled him to rise through the Baxter ranks during his 23-year-career there. 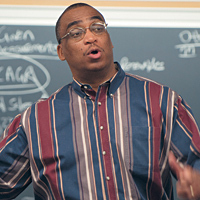 "The only way that happens is to have a very good understanding of what leadership is all about, what teamwork is all about, and what running a business in a global environment truly entails," says Kraemer, who recalls the importance of Kellogg finance and marketing classes, but says the school's well-rounded strengths provided him with a holistic leadership education. "Rather than any one class or major, the broad scope of management and leadership classes that Kellogg delivered was very, very critical for me." Kraemer says that Kellogg was visionary in its early cultivation of team-oriented education, the value of which he has seen as a corporate leader. "The ability to work with different kinds of people from many backgrounds and cultures is really what global leadership is all about, and this has been a Kellogg hallmark for decades," says Kraemer. Retiring from Baxter in 2004, Kraemer wanted to find another way to give back to Kellogg, even while he continues as an executive partner at Madison Dearborn. Today, he has returned to the classroom and teaches Managerial Leadership, conveying the importance of values-based leadership. "We have these phenomenal students from all over the world," he says. "In addition to all the fantastic analytical courses they take at Kellogg, it is great to give them real leadership examples of how to run a global company — how to make acquisitions, how to manage and lead people in 100 different countries, and how to prioritize and allocate resources." Teaching at Kellogg, says Kraemer, "is an amazing opportunity to play some role in the development of people who, over the next 10 years, will be running global corporations." Not all alumni can step into teaching roles. Some Kellogg graduates support the school in other ways. In 2006, for instance, Michael Shannon '83 and his wife Mary Sue bestowed a $1 million gift to Kellogg in honor of Larry Revsine, the John and Norma Darling Distinguished Professor of Financial Accounting. A graduate of the Kellogg Part-Time MBA Program, Shannon is the founder of Denver-based KSL Capital Partners, a $1.25 billion private equity firm. He says Revsine, who died this year, "reveled" in teaching students to become "financial detectives." 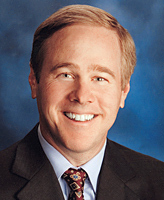 "His real-life examples of how to recast financial statements to focus on cash-generating capabilities has been invaluable during my career," says Shannon, who also credits Kellogg with providing the brand-building and cash-flow skills that helped him as CEO of Vail Associates and KSL Recreation Corp., before founding KSL Capital in 2006. "In our private equity business, the core financial skill of our analysts is to recast financial statements in a way that allows us to convert GAAP [Generally Accepted Accounting Principles] to cash flow in a useful, predictive way. Larry Revsine was at the forefront of the accounting movement that taught private equity leaders that cash, not GAAP, was truly king." Read the related story: "Executive education focuses on alumni"
Today's talented Kellogg faculty members continue to explore the intersection of teaching and research and find innovative ways to solve business problems. Whether it is Camelia Kuhnen's efforts to contribute to new areas like neurofinance, which seeks biological bases for economic behavior, or Kent Grayson's research into trust, authenticity and deception in marketing, Kellogg professors remain committed to delivering real-world value. And they have outstanding role models among senior faculty, including Rebelo, whose teaching is rooted in classical ideals. When accepting the 2007 Alumni Professor of the Year Award during Reunion this spring, Rebelo referred to Greek philosophy. "Not to compare us," he told Reunion participants, "but when Plato was an old man, his servant asked him why he kept teaching. Plato explained that he was able to learn from his masters and considered himself lucky to have time to think. "He said: 'I am a repository of knowledge and I must pass this on.'"